Visually inspect the pole and its hardware for faults or defects. 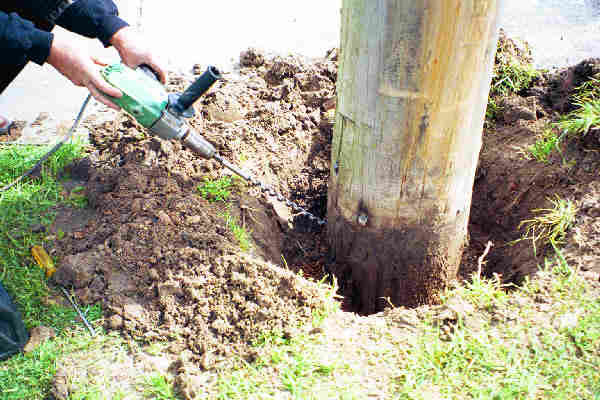 Digging around the base of the pole, probing, sounding and drilling to determine the extent of decay or termite attack. If necessary, BIOGUARD BANDAGE is installed onto the surface of the pole just below groundline to treat against external rot. If an internal treatment is required, then POLESAVER RODS are installed into the pole to treat internal rot. 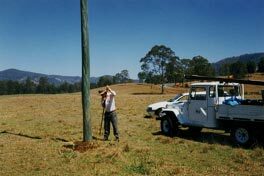 The primary role of power pole inspection is to accurately and consistently assess the condition of timber in the pole. To perform the task an inspector does not necessarily require any electrical skills ,but will need to develop a good sense of interpretation based on availability of information. There are numerous devices that have been developed to assist the process, however the judgement of an inspector remains the key to the process. It may appear obvious that external decay is easy to detect, but this is not always the case. External decay can often be disguised behind a thin crust of charring or treated sapwood. The most effective method of inspection for external decay is energetic probing with a sharp pointed instrument. It is critical to accurately quantify the quantity of external decay as most of the pole’s strength is near the outer circumference. Most pole failures are linked to some form of external decay. Internal assessment usually requires some form of drilling. Factors such as smell, colour and texture of resulting shavings and the “bite” of the drill are important considerations. Discoloured wood with poor fibre strength should be identified as being decayed and not contributing to the strength of the pole. A good inspector should consider the pole as a complete unit, and not fall into the trap of simply completing a series of individual tasks. As each task in the inspection cycle is completed, the inspector will be refining a mental picture of the condition, which is finalised at the completion of the last step in the process. In finalising an assessment, an inspector has to decide if the sound wood in the pole is capable of supporting the resulting load on that particular pole. The order in which the individual tasks are carried out will be important. Irrespective of what the specified process is, the steps are linked and often can be misleading if not done in a logical order. For example mechanical sounding or hammering will broadly indicate internal hollows and therefore influence the location of any internal drilling assessments. Experience indicates that most electrical authorities have developed local procedures for inspection. While many differ in detail, generally the overall approach is much the same. Companies may provide more focus on particular aspects of inspection if local problems exist with particular types of poles. Grading of poles with extensive decay has provided a very useful means in both prioritising replacement and creating special inspections on short cycles for poles that barely meet serviceable criteria. The role of inspection should not necessarily be confined to wood in the pole at groundline. Often visual inspection of other assets on the pole and provision of data can be incorporated into the process. This added responsibility will require some basic electrical distribution and possibly computer skills of the inspector. The process can become monotonous at times, and inspectors are prone to falling into a routine of performing the work without thinking and analysing thoroughly. Regular auditing to ensure all relevant steps are completed and analysis completed logically is absolutely critical and directly related to the quality of inspection. Retention of inspection results in a flexible data base can be a very useful tool when analysing the benefits of remedial treatment. In addition to providing defective pole information, control of the progression of decay over a period of time in serviceable poles can be monitored. A longer life for the pole may well mean other requirements such as pole top inspection and maintenance may require consideration. Poles may typically remain in service for 40-50 years which exceeds the life span of most of the other assets on the pole. Data bases that include a component for asset maintenance can be a very useful management tool in preparation of maintenance packages for most pole assets. Typically these packages should include data on crossarms, insulator, hardware, tree pruning and pole reinforcement etc. Data bases derived from pole inspection are also very powerful in strategic planning as many trends are readily identified. Examples include, effectiveness of remedial treatment, deterioration of timber on crossarms, regrowth of trees after pruning etc.